The Bushcat is an affordable solution to the problem of setting utility poles in less-than-ideal conditions. 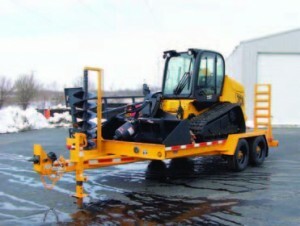 The tracked JCB skid steer has the weight and power to handle up to a 50-foot pole. Equipped with an auger drive and a pole-setting jib, this machine works like a digger or derrick, but for a lot less money.